Cherith Baldry was born in Lancashire and studied at Manchester University and St Anne’s College, Oxford. She subsequently worked as a teacher, including a spell as a lecturer at the University of Sierra Leone. Cherith is now a full-time writer of fiction for both children and adults. 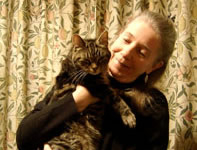 Besides the fantasies below, she writes the Abbey Mysteries for children and she write the Warriors series about cats under the penname Erin Hunter with Kate Cary and Victoria Holmes. Eaglesmount — (2001-2004) Ages 9-12. Publisher: Vair, a brave young pine marten, had hoped to show off his skill with a sword at the Watersmeet summer fair, but after his father is killed by a gang of thieves, Vair learns that his destiny will take him to Watersmeet for a more important reason. 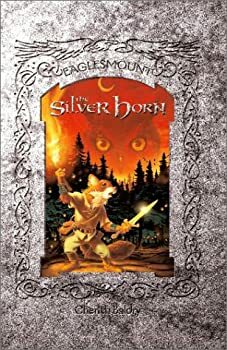 Vair, a young pine marten, talks his mom and dad into taking the family to the fair in Watersmeet, but on the way, a group of bandits led by Ragnar, a silver fox, attack them and press Vair into their service. Vair soon discovers that these bandits are working for the evil Lord Owl who plans to take over the whole country. The Lord Owl wants Ragnar’s bandits to find the legendary and powerful Silver Horn in Watersmeet. Can Vair find his family and stop the evil Owl’s plans? Saga of the Six Worlds — (1994) Publisher: A simple farm boy is led by a mystical phoenix to a book which contains the Word of God and faces great danger when he takes it from his home world on Barren to the planet Centre so it can be copied and shared. Mutiny in Space — (1999) Publisher: Cadets Jake and Ellie are determined to overthrow Lt Quentin when he and half of the crew of the spaceship “Venture” mutiny. But the situation becomes doubly difficult as it seems that Quentin is not the only one who wants control of the ship. Exiled from Camelot — (2000) Publisher: The court of Camelot is unsettled by the arrival of Loholt, King Arthur’s illegitimate son. Driven by the need for an heir, the king embraces the stranger, though not everyone in Camelot so readily accepts the mysterious young man. Arthur’s seneschal and foster brother, the redoubtable Sir Kay, is especially suspicious of Loholt’s motives. And when Loholt is killed, Kay finds himself under suspicion of murder. Stripped of his knighthood, Kay forges an unwilling alliance with the renegade Briant and his lover, the enchantress Brisane, who seek to bring down the men closest to the king. If Sir Kay cannot redirect their plot or win back the court’s trust, nothing will save Camelot from the twin threats of war and evil sorcery. The Reliquary Ring — (2002) Publisher: The setting is a fabulously wealthy maritime city where created humans (genics) are despised and exploited by the genuine human citizens. But then the sinister Count Dracone plots to seize ultimate power with the aid of infernal beings and the emissaries and technology of the sinister northern Empire. Set in a parallel Venice, this is a beautifully written fantasy of good versus evil, tolerance and charity versus fanaticism and self-interest. It draws us into not only the rich beauty and opulence of a wealthy city, undersea inhabitants and the eccentric inventiveness of the northern neighbours, but is also an excursion to hell itself. The Roses of Roazon — (2004) Publisher: When icon painter Alissende presents Joscelin, the new Duke of Roazon, with a beautifuly depicted image of the divinity as Healer, she is not aware of the impact her painting will have on the history of Avorig. Thus far the Church agrees their deity has only shown himself as Warrior or Judge. CLICK HERE FOR MORE STORIES BY CHERITH BALDRY.